It's probably no surprise, but the most important Miami Dolphin for the upcoming 2013 season will be second-year quarterback Ryan Tannehill. Game managers like Craig Krenzel, Matt Mauck and Matt Flynn may be able to win national championships in college football, but to win the Super Bowl, having an elite quarterback is a must with very few exceptions. Drafted eighth overall in 2012 by Miami, Ryan Tannehill has all the tools to be a very good if not great NFL quarterback. Tannehill has the size, the arm and the athleticism good enough to contribute as a wide receiver at Texas A&M before taking over the starting quarterback role for his previous head coach, and now offensive coordinator, Mike Sherman. The selection of Tannehill in last year's draft was a bold move for Miami as most of the Dolphins post-Marino quarterback history included getting over-the-hill former Pro Bowlers (Chad Pennington, Trent Green, Daunte Culpepper, David Garrard), career back-ups who showed potential in limited playing time (Jay Fiedler, Ray Lucas), career underachievers (Joey Harrington, Brian Griese) and players taken later in the draft (Chad Henne, John Beck). The selection of Tannehill has brought optimism about Miami's future unlike any quarterback since Marino. 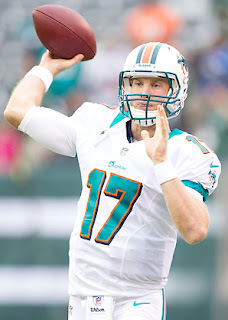 But to continue to have the support of the fan base, Tannehill must perform on the field. As a rookie, Tannehill started all 16 games and led the Dolphins to a 7-9 record, much better than most projected. This season, the Dolphins' organization made an effort to surround the second-year pro with a better supporting cast that includes Mike Wallace, Brandon Gibson and Dustin Keller. Tannehill's numbers as a rookie were pretty pedestrian as he passed for 3,294 yards with 12 touchdowns and 13 interceptions. Tannehill also ranked just 27th in the league in quarterback rating and 23rd in completion percentage at 58.3 percent. But toward the end of last season, Tannehill was much improved, especially when it came to taking care of the football. Over his final six games, Tannehill threw just two interceptions and just one over his final five games. Over those final six games, Tannehill also averaged 30 yards rushing per-game and nearly 6.5 yards-per-carry. Tannehill used both his arm and his legs to lead his first career fourth quarter comeback in a 24-21 win over Seattle on November 25th of last season. Tannehill's numbers last season were indicative of Miami's success and such will be the case again this season. When Tannehill did not throw a pick last season, the Dolphins were 6-3 compared to 1-6 when he did. When Tannehill's completion percentage hit 60, the Dolphins were 5-1 and when he threw multiple touchdown passes, Miami was 3-0. Tannehill appears to have the skill players around him to succeed in 2013, but he will also need protection. Despite his mobility, Tannehill was the eighth most sacked quarterback in 2012. After a down year, former first overall pick Jake Long is now in St. Louis and the pressure is on second-year tackle Jonathan Martin and former Atlanta Falcon Tyson Clabo to keep Tannehill upright. With expectations high, the Dolphins will need to see improvement from Tannehill's 12-touchdown, 13-interception campaign of 2012. Despite pedestrian numbers and a limited arsenal of talent around him, Tannehill and the Dolphins still overachieved a season ago and stayed in the playoff race until Week 16. To win championships in the NFL, having a good quarterback is a must and with the offseason upgrades and a year of experience, Tannehill will have every chance to prove that he is just that. While few are predicting a Super Bowl championship for Miami this year, an AFC East title is a realistic goal, but only if Ryan Tannehill can prove he is the franchise quarterback that so many of the Dolphins' faithful believe him to be.